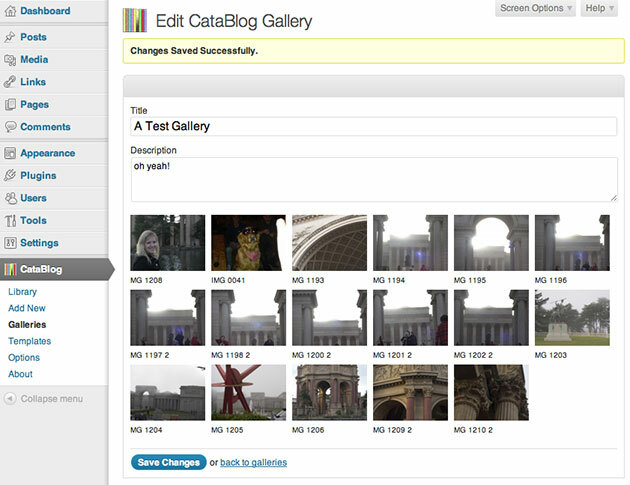 CataBlog 1.5 was released earlier today and features the new gallery section. With the new gallery section you can create custom collections of library items and save them in galleries. The main function of this feature is to allow people to organize their catalog library items in arbitrary ways that aren't possible with categories alone. To make a gallery simply open the CataBlog Gallery Admin Panel and use the form on top of the list of galleries to make a new gallery with whatever name you want. Once you have made a gallery go to the CataBlog Library Admin Panel and check the checkboxes next to the items you want to place in the new gallery, then select 'add to gallery' from the bulk actions drop down menu. You should then pick the gallery name from the drop down menu in the modal form and click the 'Add to Gallery' button. Once you have created a gallery and added some library items to it, you may want to edit the gallery. Simply go to the list of galleries and click edit, once in the edit gallery form you may change the name, give the gallery a description and remove and reorder the catalog library items in the gallery. Make sure to click 'Save Changes' to finalize all your edits before leaving the page. Please note that the CataBlog Library Screen Options will be reset after a successful update, simply go back to the Screen Options section in the upper right of the Library to enter your setting again. Thanks for your understanding. Hey Zach, thanks for the update and the gallery feature. Can different templates and sort functions be used with the galleries? You can use the limit, navigation and template attributes in a catablog gallery Shortcode. But you cannot use the sort or order attributes, as the gallery already has a predefined order. Sorting galleries could be added in a future release, we will see. Ok thanks, Zach. I have some custom work that I would like to discuss hiring you for. Please let me know if you might be interested. Yes Carl, I am so sorry for not getting back to you. I am currently unavailable and have been very busy. Still, if you want I can let you know when I am available, Thanks and have a great day. i have no lightboxeffect – the browser opens a new window with the big picture. do you have any idea for me how to fix it without new installation of the plugin? thank u zach, it was the easy table creator! I finally found a really usefull plugin, so thank you so much. When I do changes in CataBlog Options, as soon as i start to change thumbnail sizes, I cant click Safe Changes. I tried de-activating all other plugins. And cash is cleared. You know what, today it’s just working. Dont know what that was about. Yesterday it didnt work in Chrome both on my MacBook or iMac. But, maybe they had to sleep on it. On Mac, in Utilities and Java Preferences. Does “Enable applet plug-in and web start applications” be on? Glad to hear, maybe there was a caching issue, certain browsers aren’t very effective at actually clearing all there cache. Is there a away to bookmark each library item? I want to be able to send out an adorned url so that when clicked on, a specific item will be displayed… vs the user having to scroll and find the library item within the gallery. catablog pagination next button not working. please set the permalink structure of your blog to something other than the default.